Did Joseph Smith Really Have Gold Plates? Accusation: Joseph Smith never had any gold plates. This idea comes from the fact that Joseph would not show the plates to anyone while he was translating them. That was one of the first instructions the angel Moroni gave him. Sometimes when he took a break from translating, the plates lay on the table, wrapped in a cloth. His wife recounts doing housework, dusting the table and moving the plates around. Several witnesses saw the plates covered like this, even felt them thru the cloth, and some of them said they realized they were feeling a metal book; more than one said they could riffle the edges. But no one besides Joseph actually saw them during this time. This painting is incorrect; it shows Joseph translating, a scribe sitting at the table with him writing it down, and the plates in full view. Professor Charles Anthon said he learned from Martin Harris, Joseph's scribe, that the prophet worked behind a curtain. Martin had visited Anthon to get an assessment of symbols Joseph copied from the plates. "This young man was placed behind a curtain, ... and, being thus concealed from view, ... decyphered the characters in the book, and having committed some of them to paper, handed copies from behind the curtain, to those who stood on the outside. -Anthon letter to E.D. Howe, 1831; published in Mormonism Unvailed, 1834. Gordon B. Hinckley said that they probably worked with a low curtain between them so they could see each other but the scribe could not see the plates. This went on for over a year. No one got to see them in all that time. But, rumors and gossip circulated about the gold plates - gold seems to be an irresistible topic. The Smiths began to notice tramps around their farm, trying to steal the gold. If Joseph had shown the plates to people, this effect would have been magnified a thousand times over. The Book of Mormon came from a nation of Christians in the Americas around the time of Christ - the Nephites. They were annihilated in AD 385. 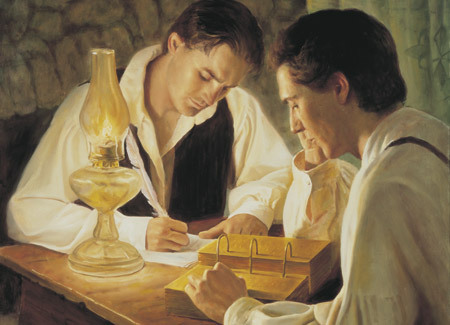 The Lord directed Mormon, one of their last prophets, to write the book. His son Moroni finished the book and cached it in the earth. There it sat for 1400 years. The Lord wanted us to have this book. The book was not made of gold in order to be fancy or pretty. In order for it to survive damp conditions for 1400 years, it had to be made of something resistant to corrosion. Moroni had possession of the plates, with people hunting him, for 35 years. I think this explains why he told Joseph to show the plates to no one at all. He knew full well how men lust for gold. This caused outsiders to doubt there even were any plates, and thus there were fewer people hunting them. Oddly enough, this impression still persists today among the less informed. "The next day ... one of the neighbors asked Mr. Smith [Joseph's father] many questions concerning the plates. ... [he] soon learned that ten or twelve men were clubbed together, with one Willard Chase, a Methodist class leader, at their head, and what was still more ridiculous, they had sent sixty or seventy miles for a certain conjurer to come and divine the place where the plates were secreted. ... after hearing of their plans, my husband concluded to go among the neighbors to see what he could learn... The first house he came to he found the conjuror and Willard Chase, together with the rest of the clan. Making an errand, he went in and sat down near the door, leaving it a little ajar in order to overhear their conversation. They stood in the yard near the door and were devising plans to find "Joe Smith's gold Bible" ... the conjuror bawled out at the top of his voice, "I am not afraid of anybody - we will have them plates in spite of Joe Smith or all the devils in hell." -History of the Prophet Joseph Smith by his Mother, Lucy Mack Smith, 1958 edition, p.104-106. Many people at the time thought Joseph was running some kind of scam. In the two or three decades before, at least three different charlatans had fleeced some wide-eyed gullibles by pretending to divine the location of buried treasure. Next: Did Anyone See the Plates?